Find out how (and why!) a skydive was carried out from a Fox glider. While we certainly do not suggest you try this at home, we do recommend you follow the expert advice on landing out safely in the April/May issue of S&G if you don’t want to become a statistic in 2016. 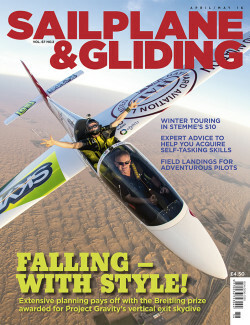 There are also top tips on how to acquire the self-tasking skills that will increase cross-country achievement and enjoyment, and you can read about a winter touring trip to Spain in a Stemme S10. A chance encounter after breakfast in a hotel close to the airfield at La Cerdanya led to Guy Westgate fulfilling an ambition of “throwing a skydiver” from his MDM-1 Fox glider. Having looked at what had been done before and identified the risk areas, the concept had to be safely proved, made legal and approved, before presenting the new activity as an airshow stunt. The GliderFX Project Gravity team performed the skydive exit at the Al Ain Airshow in December 2015. If you are looking for a challenge and have yet to acquire self-tasking skills, don’t miss this issue’s Ask the Coach feature. A rewarding skill, self-tasking is one of the most challenging to get right. Tony Cronshaw asks leading coach Kevin Atkinson for his advice on how to achieve the skills that will increase your cross-country achievement and why you should make the most of club support. Part of any cross-country task should include what will happen if the soaring plan doesn’t work. Many of the accident reports in S&G involve accidents when landing out. It happens to pilots of all experience, but it’s unusual to hear of a really experienced and talented competition pilot crashing in a field landing so Mike Fox asked Andy Davis and G Dale for their advice for anyone flying cross-country. A lot of field landing accidents reports blame the fact there was nowhere to land. Even if your only option is another airfield, you should fly with this in mind. Not always the easy option, airfields can provide challenges to both the glider pilot and airfield operator. Help is at hand from Peter Moorehead, who highlights some of the challenges you might face landing out at an airfield. There were few, if any, landing options for Steve Wilks, flying over the Pyrenees. It was a sobering moment, but an aircraft that performed equally well in its touring and soaring modes reassured him. Steve was shaking off the winter blues with a December flight in the Stemme S10 from the UK to Spain. Past winter efforts have involved towing his glider to various parts of the UK to sit in poor conditions practising his muttering skills, so Steve was delighted with the idea of winter touring in an aircraft that can be flown comfortably to where the soaring conditions look best. Also in this issue: Pete Stratten highlights the application process and support on offer when converting to a licence. Nineteen-year-old Charlie Mills becomes Southdown GC’s youngest pilot to achieve Diamond height. Tom Knauff reflects on Orville Wright’s late-night epiphany that marked the beginning of controlled flight. Eugene Lambert finds that writing a novel is uncannily similar to a cross-country flight. Tim Scott provides a guide to setting Handicap Distance Tasks that will level the playing field and highlights the challenges faced by those flying them. There’s a report and lots of pictures from the 2016 BGA Conference. BGA development officer Alison Randle asks, “Where are all the women?” Bruce Stephenson asks 15-year-old Zoe Mallam why she went down the path of vintage gliding. Rod Witter opens ‘The confessional’ to share ‘gotchas’ that lurk out there, with the aim of helping others to avoid repeating these mistakes. Plus there are many more of your stunning images in the Gallery pages.